Yapton Cottage Gardeners ended a difficult growing season with a successful flourish for the end-of-year competition. 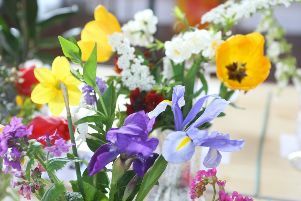 The society’s autumn flower show, staged in Yapton Village Hall on Saturday, saw 44 exhibitors, four of them newcomers, with 290 entries, which organisers say are good figures in any year. David Donovan, show secretary, said: “Undoubtedly, dahlias were the best of the cut flowers, with their varied colours and dimensions, but they were not the only flowers. “Late summer rain had improved the performance of fuchsias and generated a good number of entries, both as cut flowering stems and boxes of florets. “There were other cut flowers, assorted pot plants and fine vegetables, with good entries of tomatoes and runner beans and a varied selection of fruits - apples, pears and grapes. “The novelty section had a fine choice of sunflower heads, plus monstrous apples and heavy potatoes. “There were three exhibitors in the flower arranging but the small number of entries did not detract from the quality of the creations on the show bench. “Cookery and photography were both well contested and drew favourable comments from the respective judges. Visitors soon filled the hall to view the display and visit the side stalls of crafts, plants, preserves and cakes, the raffle table and tombola. Many stayed to take afternoon tea, too. At the close of the show, chairman Roy Phillips presented the awards and trophies. Barry Moore, who entered more classes than anyone else, gained most points on the day for the Edith Godfrey Trophy. He also won the National Dahlia Society Silver Medal with a decorative dahlia exhibit, while the Bronze Medal went to noted grower Alan Humphrey, with another vase of decorative dahlias. A single spray of chrysanthemums was enough to give Mike Shambrook the Peter Crouch Memorial Trophy. The horticultural judges selected a pair of cauliflowers displayed by Malcolm Paradine for the Deegan Shield as the best vegetable exhibit in the show. Mr Donovan amassed points throughout the year to retain the Fruit Challenge Bowl and took the Neil Baxter Memorial Trophy for cookery and handicrafts at the year’s four shows. For most points at the two later shows of the season, fuchsia exhibitor Irene Jordan just squeezed other competitors aside for the Joan Waddington Memorial Vase but it is Mick Minton who will have his name added to the Village Criers Trophy for most points in the year in the horticultural classes, reflecting an excellent August show. Another season-long cumulative award, the W.R. Trophy for flower arranging was shared, quite fittingly, by the two principal exhibitors, Katharine Horwood and Diane Booker. Eva Pendreich retained the Photography Championship Vase. Ten-year-old Cerys Hier kept the Junior Village Criers Trophy as easily the most successful child exhibitor of the year but on the day, shared the Junior Autumn Cup with Ted Coomber, five. First prize winners were: Mike Shambrook, Alan Humphrey, Marion Wilson, John Smith, Eddy Brown, Barry Moore, David Donovan, Malcolm Paradine, Mark Wilson,Terry Booker,Mike Millis,Irene Jordan,Diane Booker, Katharine Horwood, Annabelle Heath, Julia Smith,Gill Henry,Eva Pendreich,Alan Thew, Margaret Elkin, Ian Watts, Elaine Cordingley, Brannon Masters, John Knight, Cerys Hier and Ted Coomber. The spring flower show on March 23, 2019, will begin the next season of competition.